This article is about Robin's appearance in Super Smash Bros. Ultimate. For the character in other contexts, see Robin. 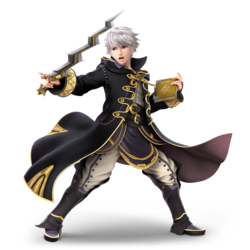 Robin (ルフレ, Reflet) is a playable character in Super Smash Bros. Ultimate who was confirmed as a playable character on June 12th, 2018. As in the previous game, both male and female versions of Robin are playable, although the male Robin is showcased in promotional material and used as the default palette swap for the character. Robin is classified as fighter #56. David Vincent and Lauren Landa's portrayals of both male and female Robin from Smash 4 were repurposed for Western editions of Ultimate, respectively. Yoshimasa Hosoya and Miyuki Sawashiro's potrayals of both male and female Robin from Smash 4 were repurposed for the Japanese editions of Ultimate. Play VS. matches, with Robin being the 53rd character to be unlocked. Clear Classic Mode with Kirby or any character in his unlock tree, being the fifth character unlocked after Zelda. Have Robin join the player's party in World of Light. With the exception of the third method, Robin must then be defeated on Castle Siege. Robin has been given a mix of buffs and nerfs from the transition to Ultimate. The most notable buff is that Robin has received significant mobility improvements: Robin’s walk speed, air speed, and most notably run speed (which was the slowest in Smash 4) are all faster, allowing Robin to catch up or escape from opponents. The universal reduction to landing lag now creates safer landing options (especially with the Levin Sword's high shieldstun), and the universal frame 3 jumpsquat allows Robin to take advantage of extremely powerful aerials. When the Levin Sword expires, Robin can now attack to speed up the process of its recharge, reducing the downtime experienced while forced to use the Bronze Sword. Several attacks have reduced lag or increased KO power, while most formerly situational attacks are more effective due to altered hitboxes: up tilt now has grounded hitboxes, and up smash has much better horizontal reach above Robin, significantly improving their reliability. Neutral aerial can now use the Levin Sword, giving it much better utility. Robin's neutral attack, a staple in the neutral game, also fares significantly better due to the improvements to neutral attacks, with the first two hits now being capable of locking; the Elwind infinite connects significantly better, and the Arcfire finisher transitions earlier, while using half the durability it used to in Smash 4. Robin's special moves have been heavily revamped. With the exception of the uncharged version, all versions of Thunder hit much harder and now function as effective KO moves, especially Thoron; the move can now also be charge-canceled by jumping. Arcfire is much harder to escape from and travels further, making it even more effective for combo initiating. Elwind can have its trajectory significantly altered and grants more distance, recharges faster, and pushes opponents if the wind blades hit the ground. Finally, Nosferatu has slightly more range, heals and deals damage at a faster rate, and has less uses, allowing it to generate a used tome much faster. However, Robin's nerfs are also notable. The biggest change is to the Levin Sword, which Robin no longer starts with at the start of a new match, forcing several seconds of downtime before the Levin Sword is usable. Robin's most effective tools have also been nerfed: Arcthunder's significantly lower looping duration now prevents followups unless initiated at a distance, Arcfire is now canceled by any other hitbox and has a smaller flame pillar, Elwind has fewer uses, and down throw has increased knockback, reducing the percent range in which combos (such as the "Checkmate", a down throw to up aerial) can be performed. Finally, Robin still possesses innate flaws that have yet to be addressed, such as a very poor grab, problems with escaping pressure due to awkward hitboxes, and passable mobility (being the 2nd slowest in the game) despite the buffs received. Overall, Robin has gained many new KO options, and has gained new benefits that patch up major issues present in Smash 4, but at the cost of several previously potent moves being less effective. As a result, it is unknown how Robin currently fares compared to the rest of the cast. 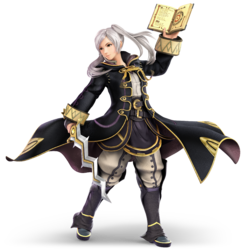 As with all veterans returning from SSB4, Robin's model features a more subdued color scheme. Both genders have hair that is more stylized, and eyes that appear sharper. The player can now see how many uses Robin's Levin Sword and each Tome has, located above their icon on the HUD. Several of Robin's alternate costumes have different hair colours that no longer match the colour of Robin's coat. For example, Male Robin's green costume now has light brown hair and Female Robin's red costume has blonde hair. These typically reference other Fire Emblem characters rather than just Robin's own customization options. Robin shares a new victory theme with Lucina that is based off "Id (Purpose)" from Fire Emblem Awakening. The hand-waving victory pose now causes flames to swirl from both hands. The sword-swinging victory pose no longer generates a sword trail. Like all characters, Robin's jumpsquat animation now takes three frames to complete (down from 7). Robin runs faster (1.15 → 1.265). Robin's initial dash is faster (1.5 → 1.815). Robin's air speed is faster (1 → 1.05). The particle effect of Robin regaining tomes and the Levin Sword are more opaque, making it much easier to tell when the weapon in question has recharged. Robin can now use aerials and smash attacks to speed up the process of recovering the Levin Sword. Discarded tomes do significantly less damage (18% → 12.3%) and knockback when thrown. First two hits of neutral attack have altered animations and can now lock. Neutral attack's fire finisher has a reduced cost, allowing for 12 uses before recharging as opposed to 6 in SSB4. The attack also comes out much faster (frame 10 → 6). Neutral attack fire finisher deals more knockback (KOs Mario 138→108 at the edge of Final Destination). Neutral infinite has reduced startup. Neutral infinite keeps opponents on the ground while hitting them, like other neutral infinites in Ultimate. This allows it to connect much more reliably, especially compared to others, as it could be escaped relatively easily in SSB4. Neutral infinite has altered particles. Up tilt has less endlag (36 frames → 33). Up tilt now starts from ground level, allowing it to hit enemies in front. Up duration lasts much longer, due to the the grounded hitbox lengthening the full animation. Dash attack has significantly less endlag (50 frames → 42). Forward smash deals slightly more knockback. All aerials have less landing lag (neutral: 18 frames → 11, forward: 18 frames → 11, back: 19 frames → 11, up: 18 frames → 11, down: 26 frames → 16). Robin can now use the Levin Sword for neutral aerial. Like other aerial attacks, this gives it more power, range and an electric effect. Neutral aerial Levin Sword uses durability as a result of the change. The player can hold both the special move and attack buttons at the same time to switch to the Levin Sword while using a neutral air. This only works if the player has the A+B Smash Attack control option enabled. Levin Sword forward aerial deals more knockback (KOs Mario 118→105 at the edge of Final Destination). A halo-like indicator now appears during Robin's grab, visualizing its range. This halo also appears when successfully grabbing an opponent. Back throw has significantly more knockback (KOs Mario 165→125 at the Edge of Final Destination). Down throw has significantly increased knockback. While it is now capable of KOing below 200%, it has less effective follow-up potential at mid percents and hinders the “checkmate” combo. Thunder charges now appear as a shrinking circle, with each stage shrinking until resizing into the next stage with a different color. This makes it easier to tell what level Thunder is at. Thunder charges are now denoted by different colors: aqua for Thunder, yellow for Elthunder, and purple for Arcthunder. The covers for Thunder's tomes now change to denote the charge levels of the move. Thunder, Elthunder, and Arcthunder have 1 frame more of start up lag (frame 11 → 12). Thunder can now be charge-canceled midair by jumping. Thunder deals more damage (4.5% → 5.5%). Elthunder has a dark purple color compared to how it was in SSB4. Elthunder deals more damage (10.5% → 11%) and thus more knockback, KOing earlier. Arcthunder deals significantly more damage (10% → 23.6%) and knockback, now being a viable KO move. Arcthunder keeps opponents in place for a much shorter time. As a result, Robin can no longer act fast enough to follow up with the trapping hits, unless the move connects at a distance where Robin can run beside the projectile. Thoron deals much more knockback, making it a powerful KO move at 105% or above. Arcfire's projectile travels further in midair. Arcfire deals more damage (10% → 15%). Arcfire is much harder to escape. Arcfire's pillar of fire is smaller than before. Arcfire's pillar no longer activates when hitting another hitbox. Elwind projectiles are thicker and more opaque. Elwind's projectiles can now be angled, letting Robin go twice in the same direction, improving horizontal recovery by making it less linear and less predictable. Additionally, the move has been sped up and can travel further horizontally. Elwind sends Robin much higher. Robin grabs the ledges faster when using Elwind backwards (52 frames → 39). Elwind projectiles now push opponents away when they hit the ground. Elwind recharges faster (6 seconds → 4 seconds). Elwind has fewer uses before needing to recharge (9 → 5). When using Elwind while depleted, Robin will now gain a short upward boost upward, slightly improving the chance of a successful recovery. The short boost does not render him helpless, meaning Robin can follow up with a midair jump or directional air dodge. Nosferatu is more opaque and has fewer particles, now looking more like a dark whirlpool instead of a cloud of particles. Nosferatu has slightly more range. Nosferatu's hits have been sped up, allowing Robin to heal and deal damage at a faster rate than before. Nosferatu has significantly less endlag (56 frames → 50). Nosferatu has reduced uses (4 uses → 3). Nosferatu recharges faster (40 seconds → 30) This combined with the reduce of endlag, allows Robin to expend its uses and use the book as a throwing item notably faster than before. Thunder and Elthunder deal less shield damage. Arcfire deals less shield damage. Robin using his Tomes and the meter going down as he does so, as shown by a Skill Preview in Ultimate. Robin cannot immediately use the Levin Sword: its durability must reach maximum capacity before being used. This only occurs on Robin’s first stock, as subsequent stocks start with it. Robin's tilt attacks solely use the Bronze Sword, while smash attacks use the Levin Sword, provided it is not broken. All aerials can use either sword—if Robin tilts a direction in midair, the Bronze Sword will be used, but if Robin taps a direction like a smash attack, the Levin Sword will be used instead. Robin can now also use the Levin Sword for a neutral aerial by pressing the attack button and the special move button simultaneously. However, this only works if the player has the A+B Smash Attack control option enabled. If the player has smash attacks mapped to their C-stick and Levin sword available, Robin will always use Levin sword for aerial's if the C-stick is used for the attack direction, as the game still reads the input as a smash attack even though Robin is in the air. If the C-stick is mapped to tilt attacks then using the C-stick while in the air will always use the Bronze sword (unless the Levin Sword was brought out beforehand, in which case it will need to be put away and the Bronze Sword brought out- see below). After using the Levin Sword for any attack, Robin will continue to use it for all directional aerial attacks until it breaks or if he uses an attack that resets his equipped sword to the Bronze Sword. The attacks that switch to the Bronze Sword are his neutral attack, tilt attacks, dash attack, floor attacks, and edge attack. KO'ing opponents will hasten the reload time of all of his weapons. Using aerials and smash attacks will hasten the recharge time of his Levin Sword. 2% An upward slash followed by a downward slash. The move can then proceed to a third finishing hit or into a neutral infinite, depending on whether the attack button is held or button mashed. The former is a fiery explosion, and the latter is a barrage of blade-shaped blasts of wind magic that hits multiple times and ends with a more powerful blast. Each of the third hits consume durability of the Arcfire and Elwind tomes, respectively. If both tomes are depleted, Robin will only be able to use the first two sword slashes. 7.5% An outward turning, downward slash. 6% An inward turning, upward slash. 6% A crouching, outward slash. 10% (clean), 6% (late) Slides forward, thrusting the Bronze Sword at a low angle. Levin: 16% An underhanded outward thrust. Levin: 10% (early), 15% (clean), 10% (late) The animation differs depending on the sword that is used: if it is the Bronze Sword, Robin thrusts it upward. If it is the Levin Sword, Robin levitates it out of his hand, and twirls it before raising it upward. The Levin Sword version of has great coverage, capable of hitting opponents on the ground and behind Robin. Its large hitbox also allows it to combo reliably from down throw at 0%. Levin: 15% (clean), 12% (late) Kneels and strikes the floor via a slash with the equipped sword. The Levin Sword generates brief sparks on both sides of Robin, which can hit opponents even after getting up, thus warding off punishment attempts on either side. Levin: 11.5% An inward slash forwards, followed by an outward slash backwards. If the special move and attack button are pressed (provided the A+B control setting is turned on), Robin will switch to the Levin Sword. The Levin Sword version of this move deals increased damage and covers both sides with increased range. Unlike in Smash 4, using neutral air will not put away the Levin Sword. Levin:12.5% (clean), 5% (late) An upward swipe. Because of its arc, it can catch grounded opponents while in the air. It has very poor KO potential with the Bronze Sword, but its knockback makes it easy to combo with, usually into itself, or other aerials. Levin: 15% (clean), 5% (late) A backward thrust. Fast, but has a somewhat narrow hitbox which can make landing it awkward, though it still autocancels from a short hop. It can hit a few frames after ending while using the Levin Sword, which can surprise opponents. Levin: 13% (clean), 5% (late) An upward overhead slash. It is a great juggling option with the Bronze Sword due to its low knockback and large arc, while it is one of Robin's most effective aerials with the Levin Sword due to its massive range and KO potential. It has lingering hitboxes with the Levin Sword. Levin: 11% (clean), 8% (late) A downward slash. It also hits slightly in front of Robin. The sweetspot in the middle of the Levin Sword can meteor smash while it is swung down, while the Bronze Sword cannot meteor smash at all. The move has a lingering hitbox if the Levin Sword is used. — Wraps the opponent in a whirling stream of magic. The grab's range is visualized by a halo. This halo also appears when Robin successfully grabs an opponent. 1.5% A small blast of magic. Although weaker, it is also much faster compared to its previous iteration. 8% Magically shoves the opponent forward. 11% Turns around and magically tosses the opponent backward. Robin's strongest throw, with very high base knockback and decently high knockback growth. 9% Magically heaves the opponent upwards. 6% Magically slams the opponent onto the ground, launching them vertically upward. Its knockback has been increased from the previous game, which allows for KOs below 200%. However, this removes Robin's ability to perform effective follow-ups at 100% or higher. 7% Swipes forward with the Bronze Sword, then backward. 7% Same as frontal floor attack, but strikes backwards first. 5% Same as back floor attack. 9% Performs a thrust with the Bronze Sword while climbing up. Thunder 5.5% (Thunder), 11% (Elthunder), 23.6% (Arcthunder), 15.6% (Thoron), 18.2% (Thoron, held) Robin casts thunder magic from his Thunder tome. It is a chargeable projectile with distinct properties for each charge level: Thunder (a fast, weak, and short-ranged spark) is produced when the move is uncharged, followed by Elthunder (a stronger ball of lightning with more range) which is cast when briefly charged, then Arcthunder (a gradually accelerating and multiple hitting sphere), and finally Thoron (a long-ranged, powerful and electrical energy beam) when fully charged. Thoron deals more damage if the special button is held. Both Arcthunder and Thoron are very powerful, with Arcthunder KOing at 120% from the edge of Final Destination, and Thoron doing so at 90%. Like other chargeable moves, Robin can cancel the charge with a jump, airdodge, or offensive option. Arcfire 2% hit 1), 1.2% (hits 2-8), 4% (hit 9) Robin casts fire magic from his Arcfire tome. It creates a tiny fireball that travels diagonally downward from above his head and bursts into a pillar of flame on impact. It usually hits 8 times, but can hit 9 times if an opponent does not mash out of the looping hits. It is primarily useful for disrupting approaches and capitalizing on the opponent's reaction, while it can also be used for edgeguarding, either by directly attacking the opponent or covering the edge as they attempt to grab it. Elwind 5% (first blade), 7% (second blade) Robin casts wind magic twice from the Elwind tome, which propels Robin upwards. Elwind's projectiles can be angled, letting Robin go twice in the same direction, providing a great horizontal recovery. If used while depleted, Robin will gain a short upward boost upward, slightly improving his change of survival. Each wind blade generates a push effect on impact with the ground. Nosferatu 2% (loop) Robin casts Nosferatu on a nearby opponent to drain their health and heal Robin. Inflicts constant damage and cannot be shielded due to acting like a grab. Nearby opponents will take damage as well. Pair Up 3% (initial hit), 26% (combo), 18% (final hit) Summons Chrom via warp magic to pair up and attack. Chrom slashes the opponent upward into the air and then he and Robin relentlessly attack the opponent, with Chrom repeatedly slashing with Falchion, while Robin casts thunder and fire magic, including Bolganone. After they finish their barrage, they perform a final simultaneous strike that spikes the opponent to the ground, which deals enough recoil to launch them towards the upper blast line. Upon successful use, all of Robin's weapons (including the ones that have yet to break) will have their durability restored. Robin has a unique mechanic: true to the Fire Emblem series, where items break after being used too many times, Robin's tomes and Levin Sword do the same if they are used too often. If Robin attempts to use an attack that uses durability-affected weaponry and is interrupted by an attack while attempting to use it, then that will count as one use of the weapon, even if no damaging hitbox is produced. Robin always carries the last weapons he used in his hands, provided they are not depleted. The amount of remaining durability is displayed in the form of a bar that appears above their icon on the HUD. Once a depleted weapon is restored, a unique animation of the weapon appearing in one hand with a flash of light will start, provided that Robin is standing completely still; tomes appear in the left hand while holding it up in the air, while the Levin Sword reappears in the right hand while flicking it in a manner similar to one of Robin’s idle poses. These poses can be cancelled, similarly to taunts. If Robin fully depletes a weapon, it will be tossed backwards, hitting any opponents before it dissapears. In the case where Robin is sent flying by knockback immediately after depleting a weapon, the used weapon will be dropped on the ground before Robin is knocked back. They disappear almost immediately after hitting the ground once, but they can also be picked up and thrown. The Levin Sword deals 15% when smash thrown, while his tomes deal 18% when smash thrown, making both attacks potent surprise KOing options due to their high base knockback. The discarded weapons can also lock if Z-dropped on an opponent. If Robin does not have the proper tome for a given special move and tries to perform it, Robin will perform the animation but will not produce any hitboxes. For the Levin Sword, all such attacks will instead use the Bronze Sword, which cannot break, but has shorter range, deals considerably less damage and knockback, and also lacks the Levin Sword's lingering electrical hitboxes. Weapons restore gradually after they have been depleted, which is displayed as the meter refilling its units. When Robin scores a KO, it reduces the respawn timer for all currently-regenerating weapons by a small amount. Alternatively, aerials and smash attacks will hasten the respawn time for the Levin Sword. Durability points for weapons do not replenish while Robin is using a tome, and the only way to replenish a weapon is to get a new copy of it. Respawning after being KO'd also replenishes all weapons, as does Pair Up, though only if it is used successfully. Note: All weapons' durability meters are composed of 20 "units". However, different weapons can only be used so many times. Even if Thunder has less durability than the desired spell requires, it can still be performed, though the tome will be immediately depleted afterward. Thunder respawns after 10 seconds, minus 1.5 seconds per KO. Thunder consumes 1 durability unit. Thunder can be used 20 times by itself before the tome breaks. Elthunder consumes 3 durability units. Elthunder can be used 7 times by itself before breaking the tome. Arcthunder consumes 5 durability units. Arcthunder can be used 4 times by itself before breaking the tome. Thoron consumes 8 durability units. Thoron can be used 3 times by itself before breaking the tome. If Kirby copies Robin, he will lose the Copy Ability altogether once he consumes all of his Thunder's 20 durability units. Arcfire consumes 3.3 units of durability, while neutral attack hit 3 consumes 1.67 units. Arcfire can be used 6 times before breaking the tome, while neutral hit 3 can be used 12 times. Arcfire respawns 10 seconds after being depleted, minus 1 second per KO. Elwind consumes 4 units of durability (2 per blast), while his neutral infinite uses 2 durability units for every second. Elwind can be used 5 times before breaking, while his neutral infinite will last 10 seconds before breaking. It respawns 4 seconds after being depleted, minus 2 seconds per KO. Nosferatu consumes 6.67 units of durability. Nosferatu can be used 3 times before depletion. It respawns 30 seconds after being depleted, minus 1 second per KO. Levin Sword consumes 2.5 durability units, breaking after 8 uses. It respawns 6 seconds after breaking, minus 3 seconds per KO, and minus 1 second for every aerial and smash attack used. Warps onto the stage using warp magic. Closes his eyes and turns around, opening the active tome to read it briefly. Slowly waves the active sword forwards with a flourish. If Lucina is present after a match, male Robin sometimes says "Lucina, I hope I didn't hurt you." In the Japanese version, he says ルキナ、痛くなかったかい? (Lucina, are you hurt?) This is rather glitchy, as it can play even if Lucina does not participate in a match. If Robin used Pair Up during the match, Chrom will sometimes say "My strength is yours!" In the Japanese version he says お前は俺が守る! (I'll protect you! ), the same quote Chrom shouts when a unit pairs up with him in Awakening. Oddly, this clip is unavailable in the Sound Test. A short orchestral cover of "Id (Purpose)" from Fire Emblem Awakening. Robin fights in 2-on-1 battles against one electricity and one fire-affiliated fighter. 1 Pichu and Charizard Pokémon Stadium Prelude (Ablaze) Charizard's Pokémon Trainer is absent. Note: Every round except the bonus stage and boss plays a track from Fire Emblem. Although neither gender of Robin appears in the World of Light opening cutscene, they were vaporized and later imprisoned alongside the rest of the fighters (sans Kirby) when Galeem unleashed his beams of light. Male Robin was one of the many fighters that fell under Dharkon's control upon Galeem's first defeat. He can be found in the Dracula's Castle sub-area as the last fighter to be awakened aside from Richter before confronting Dracula; a ghost blocks Robin on the ladder below, and if Wario had been previously awakened by rotating the lever blocking him, said lever must be switched back to its original orientation for the cannon to ricochet off and destroy the ghost. Robin's Fighter Spirits can be obtained by completing Classic Mode. They are also available periodically for purchase in the shop for 500 coins. Unlocking Robin in World of Light allows the player to preview the first spirit below in the Spirit List under the name "???". As Fighter Spirits, they cannot be used in Spirit Battles and are purely aesthetic. Unlike most fighters, the Spirits for Robin only use their artwork from Ultimate, rather than also having alternative artwork from a previous appearance. Screenshot of all playable Fire Emblem characters on Arena Ferox, as posted on the official Japanese Fire Emblem Twitter account. Male Robin using Arcfire on Temple. Male Robin hitting Villager and Sonic with his down smash on Wily Castle. Male Robin Taunting with Toon Link on Wii Fit Studio. Female Robin attacking Wii Fit Trainer using her neutral infinite on Temple. Male and female Robins in their green and pink costumes, respectively, on Tomodachi Life. Female Robin and Chrom standing back-to-back on Coliseum. Male Robin using Arcfire on Gaur Plain. With all playable Fire Emblem veterans on Coliseum. HUD showing Female Robin and the amount of health the Thunder tome has remaining. Female Robin's pose in her official art resembles the third hit of her Arcfire neutral attack. This makes Robin one of the two characters who have a separate (and playable) character in one of their victory poses, the other being Piranha Plant (which has Mario in its case). Male Robin will sometimes say the quote: "Lucina, I hope I didn't hurt you." when fighting against Lucina. However, this may occur even when his opponent is entirely someone else. Robin is the only character who travels to Mushroom Kingdom II in Classic Mode. Robin, along with Cloud, Wii Fit Trainer, and Pokemon Trainer, is the only character to have their Fighter Spirit be only their artwork in the game and not from their original game. A possible explanation could be that Robin has no official artwork of them in Fire Emblem Awakening as they are a customizable avatar and don't appear on any promotional material compared to Corrin, as Fire Emblem Awakening, the game where Robin originates, mainly features Chrom and Lucina instead. Interestingly, both the thigh armor and leg warmers around Robin's boots appear to completely vanish when looked at from the inside. This oddity was not present in either gender's Super Smash Bros. for Wii U in-game models or on their official Ultimate artworks. In Sounds, most characters with male and female alternate costumes have two announcer voice clips, to accommodate for languages with gendered nouns (for example, Inkling in Spanish is "Inkling chica" for female costumes and "Inkling chico" for male costumes). Unusually, Robin also has two announcer voice clips, even though their name is the same between genders in all languages. Furthermore, Corrin only has one voice clip, meaning this is unique to Robin. With the addition of the DLC Igor Spirit, Robin is now one of the few characters who can appear in their default costume as a puppet in Spirit battles. The others being Mr. Game & Watch, Bowser Jr., Yoshi, Inkling and Joker. This page was last edited on April 20, 2019, at 17:30.